"Fix-It and Forget It Cookbook Revised & Updated: 700 Great Slow Cooker Recipes"
"Little fuss. Lots of flavor. We busy people love that!" "Substitute Ingredients for When You're in a Pinch"
"Kitchen Tools and Equipment You May Have Overlooked"
"Assumptions about Ingredients in Fix-It and Forget-It Cookbook, Revised and Updated"
2. Pour into greased slow cooker. Cook on Low 6 hours, or until toothpick inserted in center comes out clean. Serving suggestion: Serve like spoon bread, or invert the pot, remove bread, and cut into wedges. 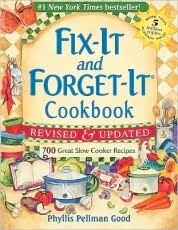 I have used the original "Fix-It and Forget-It Cookbook" for years. It is one of the most used cookbooks in my kitchen library. I jumped at the chance to be able to review the "Revised and Updated" version, because the first was a great cookbook. I was a little concerned, as I thought that the revisions would end up removing recipes or changing them to a more "healthy" and possibly less flavorful versions of those that made the original great. The "Revised and Updated" version is definitely worth getting! After putting both the original and "Revised and Updated" books side by side and comparing them, the "Revised and Updated" wins hands down. There have been recipes eliminated, but only those that I found that were redundant or very similar. One hundred new recipes were added in their place. The "Revised and Updated" edition contains hints and tips that are wonderful, beautiful mouthwatering photos, and what I found really useful was how large of a crockpot to use. Many times, I had to move up to a larger one, because I underestimated the amount. Now no more guesswork! Another useful hint I really liked tells how to find out what temperature your slow cooker cooks at. Now, with this information, you will have the perfect dish instead of one that may come out underdone or overdone. I learned quite a bit from this book, plus all my favorite recipes like Pirate Stew (p44), Full-Flavored Beef Stew (p85) and Cherry Delight (p250) are still included. I have retired the original "Fix-It and Forget It Cookbook" and passed it on, replacing it with the "Revised and Updated" edition. It really is a better cookbook than the last! This is a must have for anyone that loves to come home to a good home cooked meal. I highly recommend it!!! Phyllis Pellman Good is Executive Editor at Good Books. (Good Books has published hundreds of titles by more than 135 authors.) She received her B.A. and M.A. in English from New York University. She and her husband, Merle, live in Lancaster, Pennsylvania. They are the parents of two young-adult daughters. For a complete listing of books by Phyllis Pellman Good, visit www.GoodBooks.com. You can also visit Phyllis's blog at: http://fix-itandenjoy-it.com/blog/ and find her on Facebook at: www.facebook.com/fixitandforgetit. Book excerpt was provided by FSB Media. Book was provided by FSB Media to be honestly reviewed. I have an older version that I like. My only compliant with mine is that the sizes are usually way to big for me and my husband. And halving can be inconvenient or wasteful. I try to make things that don't call for more than 1 pound of meat or we just can't eat it all. Have you noticed any smaller portions? I'm sorry to say that most of the recipes are for 4 or more servings. There are a handful that list 2, but not many. The recipes calling for 1 pound of meat are mostly ground beef ones. Have you tried freezing any of the leftovers? Sometimes I make a big batch and freeze some (in fitting portions) for those days when there's no time to cook. Sure saves on the cost of fast food! Winners Announced for "Stay A Little Longer"
Changes - Some You'll Notice, Some You Won't.